There are few 'Awards' ceremonies worth bothering with. Trust me and have a brief look across the pond: San Francisco and last night's 'Crunchies' - the awards of TechCrunch. Here's what you need to know. The short version. Cloud services couldn't be more zeitgeisty unless they were, I don't know: German. Dropbox was the overall winner with further kudos going to onLive (cloud gaming), Spotify and Evernote. 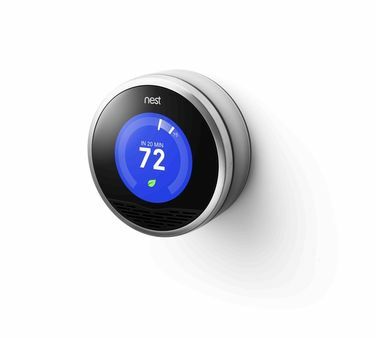 Nest - a new thermostat. Made by the guy that led the iPod and early iPhone teams. Came out of retirement because he was building a new house and got annoyed at paying $350 for a thermostat that was ugly and hard to use. Invented a new, beautiful device using smartphone innards. Fotopedia, launched by 5 ex-Apple employees, provides curated photo collections of historical or special interest. These are released in small collections as iOs apps. Currently numbering nine these include Fotopedia Heritage, Fotopedia National Parks, Fotopedia Magazine and 'National Geographic'. Square is the development by Twitter co-founder and software engineer Jack Dorsey of an iPhone accessory that enables you to instantly read and take secure card payments. Now processing $11 million+ per day. Fab.com is a Groupon / Asos hybrid offering big daily discounts on specific fashion items. Matching up 'social media' with 'fashion' is bound to be strong since fashion itself is socially generated. Asos enjoys user-generated 'looks for him and her' where items from various designers are pinned together to provide inspiration as an online alternative to shop-window dummies. Check out their current trending 'Looks for Men'. There are plenty of Pinterest boards along those lines too. Another Crunchies winner (Best Startup). Check out the 'My Style' boards. Interesting that 'Fab.com' started as a 'gay social networking' site before doing the now mandatory 'pivot' into an entirely different business model.